This series looks at using Dokku to deploy (Rails) apps. The concepts should hold regardless of what language/framework you’re using, though some of my examples may be Rails specific. A lot of this hinges on the fact that Codeship automatically reads your repository’s branches, and these can be used to build and deploy different environments. The Url Grey repo has two main branches: production and staging, and these represent the two main deployment pipelines I’ve created for the app in Codeship. I’m assuming that you’ve already got testing and build instructions set up in Codeship. If not, check out the second post in the series to get an idea of what that would look like. That test setup will run every time you push to your repo, regardless of branch (which is great for making sure PRs are OK for merging). Your deployment actions happen after that on any branch you specify. You can set as many of these as you need. It’s a little grey, but above the script you can see this is for my production environment. 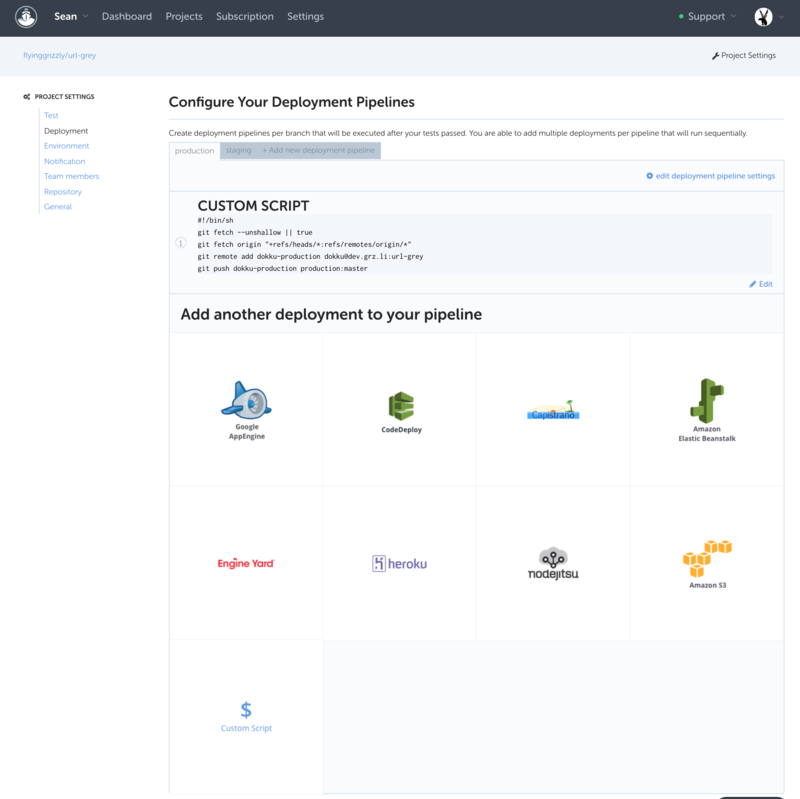 Here, you can set as many deployments with as many services as you need. For Dokku, we’re just going to create a Custom Script deployment. Once you’ve selected that, you’ll get a bash-styled script editor (again, if you’ve been following from the last post). This can be exactly what you want, and will pull environment variables from Codeship’s Environment settings as well. You’ll need to do this for every application you’re deploying with Codeship, because the key is different for each one (though if you’re deploying the same app multiple times, you only need one key for the bunch because Codeship treats these as different pipelines). The key name needs to be unique, so maybe codeship_app_name would work well. With that in place, Codeship should be ready to go. You can test by pushing a commit to the branch you set up the deployment pipeline for and watch it go. Any failures in deployment will appear as a failed Codeship build, and will be angry red in the Dashboard. You can also check Dokku’s SSH docs if you need more info. Both are pretty easy fixes, though which is good. It’s that last bit that’s important. It tells git that even though we’re working in the production branch right now, we need to push to the remote’s master branch. This is because Dokku only builds from the master branch (though it looks like this can be configured with environment variables). The good news is that Dokku supports an app.json file, much like Heroku. You can load any post- or pre-deplyment tasks into here and Dokku will run them as the dokku user. No passwords, no environment variables. Hurray! "predeploy": "bundle exec rake db:migrate"
The difference between pre- and post-deployment tasks wasn’t clear to me at first, but a quick test revealed: both run after app compilation, but pre-deployment runs before the current build is replaced by the new one, and the post-deployment runs after the app is replaced. So a database migration should be a predeployment task. If you want to see more about deployment tasks, check Dokku’s docs. And that about wraps up the automated deployment stuff. Once the other stuff is in place, it’s all a lot easier. Thankfully! See you next time for the back up post!